Children's Luggage When Travelling With Kids? There can be many reasons why you might want to consider special children's luggage when travelling with kids. Children love to feel grown-ups, having their own bag will definitely make them feel older and hence more responsible. They will feel more involved in the trip preparation if they have their own kid luggage to pack and the more involved they are, the more likely they are to enjoy themselves. Packing their bag will also keep them occupied, both during the preparation but also while travelling. Children rolling luggage is great way to keep your youngster busy at the airport. Most of us by now have seen those adorable busy little travelers. There is available child luggage that has multipurpose function, which is an extra bonus, e.g. when your kid can sit and rest on the luggage when tired. You can even get children's luggage that entertains them while travelling. When choosing child luggage you might want to consider the same features as you do when choosing your own Travel Luggage. That is size, weight, wheeled or non-wheeled luggage, soft or hard sided bag, durability, style and price. However, your child age is of course the most important factor when deciding which kid luggage to choose. The age of your child determines all the decisions you have to take. Small children rolling luggage is ideal choice for the younger kids. You will of course have to supervise what goes into the bag, which will mainly be things to keep your child entertained and comfortable while travelling. If your child is wheeling the bag (which it is likely to insist upon) then you must consider the weight carefully, i.e. both the weight of the actual bag but also the weight of the content. There are many fun options available and many have multipurpose use that is an extra bonus. Trunki kid luggage is one of the most popular choices for children aged 3-6 year old. What is Trunki? 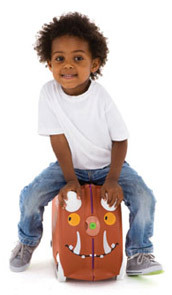 Trunki is a children luggage designed specifically with the little people in mind. The concept is based on the child's usability when travelling through airports or railway stations. The luggage range consists of number of different animal characters that children can easily associate with. Trunki children's luggage is colorful and fun so kids love the design. It is easy for them to wheel their Trunki around, making them feel soooo grown-up. However, when they get tired, they can rest on their Trunki and leave the hard work up to their parents, or older siblings. You can use the strap either to pull your kid on its' Trunki or to carry it on your shoulder if your kid wants to walk... making Trunki user friendly for the adults as well. There are number of Trunki accessories available, like the Saddlebag that doubles as messenger bag and saddle, making the ride on Trunki more comfortable for your kid. You can even get decorative sticker set so you kid can enjoy personalizing its' Trunki. Trunki is fairly light (weighs about 2.3 kg or 5.1 pounds), has 18 liter capacity while still being within most airlines carry-on luggage limits (always check with your airline before travelling). It is safe, secure, and durable but best of all... the kids love it. The founder of Trunki, Rob Law, appeared on the popular BBC's hit TV show Dragons' Den in 2006, looking for investment in his Trunki children's luggage range. His investment proposal was turned down. Couple of the Dragons' Den investors have since admitted that they regret not investing. Older children can be involved in choosing and packing all of their belongings, including clothes and toiletries. Which type of luggage to choose would then depend profoundly on your travel destination and the length of your journey. You might consider giving them their own carry-on bag to pack all their belongings when going on shorter journeys, while preferring to pack all main items in shared check-in bags on longer journeys. Allowing each family member only a small carry-on bag for what they need while travelling, i.e. snack, entertainment, extra layers of clothes, etc. Backpacks and duffel bags are popular choose with the older children, and there are many lightweight and wheeled options available. One of the things you should have in mind when choosing children's luggage is the longevity of the bag. Children tend to grow out of things relatively quickly, especially if they are very current (like most fashion items) or when aimed towards special age group (and they become “too old for that”). Children Vacation Packing List - Free printable packing checklist for children, including why have seperate children luggage and luggage packing games for children. School Age Children Travel Tips - School age children travel tips. This article covers planning international travel with children of school age. Practical school age children travel tips, flying with children, travel games for children, travel insurance for children and more. Teenagers Packing For A Trip - Let your teen pack its' own luggage and use our free vacation packing lists help him or her to stay within the carry on luggage restrictions. Toddler Travel Tips - Why not just leave them at home? This article provides useful toddler travel tips when travelling with your much loved little troublemaker. Travelling with toddler can be hard work but it can still be fun and rewarding. Toddlers Packing Checklist - Packing list for travel is great when travelling with toddlers. Travel Car Seat - Special travel car seat is required by law in many countries. How do they work? Also, review of Trunki BoostApak, a car seat and kid luggage in one, making it ideal for travelling. Travelling With Teenagers - This article covers practical teenagers travel tips such as; how to plan your teens holiday, activities, sightseeing, how to make new friends, tech free holidays and more.